Acme H4-108D2 socket H4 short 1U storage server. This system is with special features--- 2 GbE & 2 10GbE (can add more), 8 hot-swap 2.5" HDD, new Xeon E3 v6 (or i5/i7 7gen) computing power. It is good for industry controller, or small email/web server. 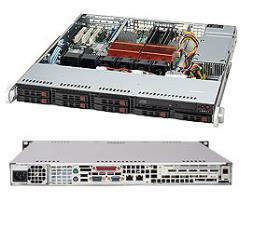 1U 20-inch rackmount system with Intel LGA1151 Xeon E3-1200 v6 /core i3/i5/i7 (7th Gen) series processors. Intel® Xeon® E3-1200 v6 series, Intel® 7st Gen Core i3/i5/i7, Intel® Pentium® and Celeron processors. Supports up to 64GB of Unbuffered ECC/non-ECC DDR4 2400MHz memory. 2-channel for best performance. 1U RackMount case with 560W power supply (80+ gold). 8 of 2.5" HDD bays (hot-swap w/backplane SAS/SATA, need to add SAS controller if more than 4 drives).